Have you found the best family camping tent to bring along on your camping trip with your family? Camping with the family can be fun and exciting, but it can also turn out to be a nightmare if you go without the right preparations. Chances are that you’ll be able to create wonderful memories with the kids when you have everything well-prepared. This article will give you a guide on choosing the camping tent for you and your family. Ask yourself how many campers are going on this camping trip. The number of campers will be crucial to your decision in considering what type of camping tent you should purchase. 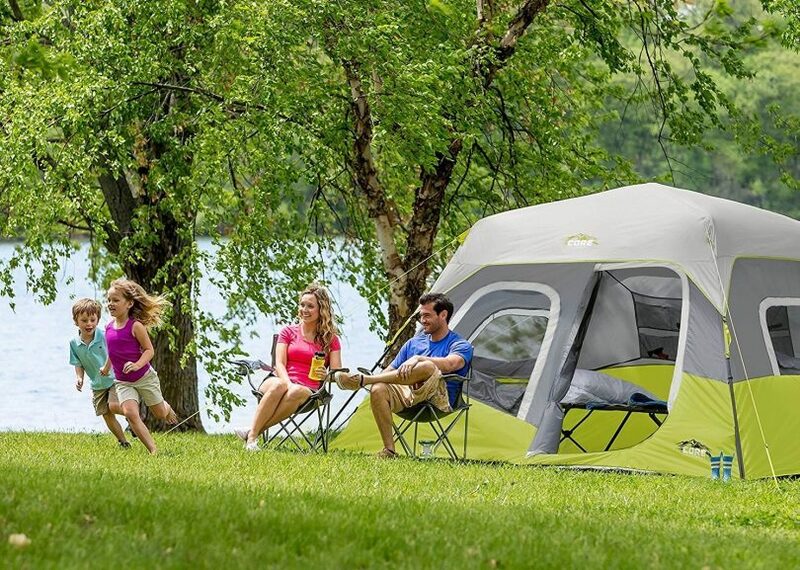 In the market, there are family camping tents that fit up to 5, 6 and even up to 10 if you’re looking for camping tents that is able to accommodate a large group of campers. Keep in mind that if the manufacturer states that the tent is designed for only 6 persons, it does not include having your baggage and other belongings set aside in the tent. It means there is only space to fit 6 persons in the tent. You may need a bigger campsite if you were to bring along a big tent with a huge surface area. Tired of carrying all the heavy stuff with you into the woods? 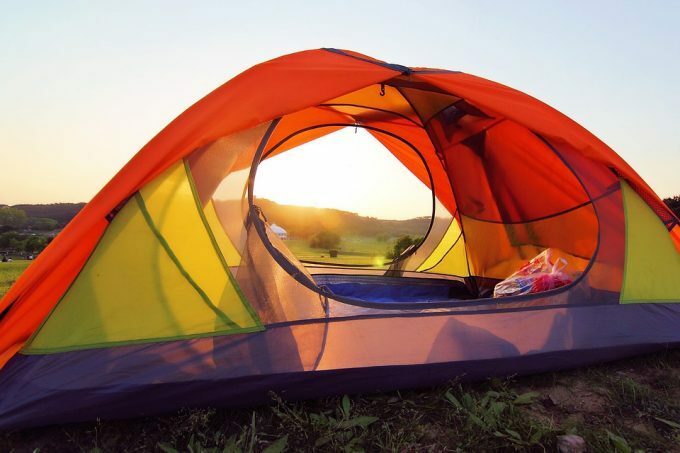 As a buying tip, look for the type of camping tent in the market that comes with a storage bag, and ensure that the material of the tent is light in weight and is compact. Look for a tent that has a strong and durable floor. You should ensure that it is able to provide protection from poor weather conditions, as well as being able to withstand the weight of bodies moving around against the rough ground. This is the most important factor when it comes to making a decision or whether or not you should purchase the item. We understand that everyone has a different budget and that some may prefer to go for thriftier options. However, do note that if you are looking for the cheapest tent available, you may not find that a tent lasts long. Check the manufacturer’s details before deciding on which tent to purchase. It is important to understand that when you’re asking for quality, there is certainly a price for it. Consider the type of tent that you would like to purchase and whether these may be able to resist any type of weather you may face on your camping trips. If you’re going to be camping in extreme weather conditions, we will not recommend going for the cheapest options, as the materials of the tent will not be able to provide much protection. Just like any other product, a great camping tent may be costly. But it would be a good idea to look around at different shops to make a comparison of the different prices of the tents before deciding which one to get. Keep an eye out for sales or go shopping in the off-season when tents will be cheaper. Getting your tent from overseas could be cheaper too, but you have no way of expecting the tent for yourself until it’s already on your doorstep. Some tents come with a money-back guarantee or warranty cards. It is best to read the information on the tent to check whether it comes with a warranty card. You can always surf the net to read different reviews from other buyers to find out their experiences with the tent you’ve purchased. Quality manufacturers would most likely include a warranty card or a money-back guarantee as they are very confident about their products. Do find the type of tent that comes from a great manufacturer so that you are sure that you have got the right product. A little research before shopping is crucial at this point. Cotton is a good material, but it is quite hard to find in most stores. It is suitable for summer camping trips as the fabric of the tent allows for better ventilation and is less prone to condensation. However, it may not be suitable during rainy seasons. You’ll be able to find some that are weatherproof with another coating, applied to the cotton fabric, but this affects the breathability of the material. The only disadvantage of this type of material is that it is heavier in weight and may have issues with condensation, but it is strong and waterproof, making it perfect for summer or wet weather camping trips. Similar to how clothes are made, this material is a combination of cotton and polyester, which makes it much lighter. It repels water so it is suitable for your camping trips in the fall or winter. Such material may come with different selections of coatings. When it comes to choosing polyester tents, you need to ensure that the added coating that provides great breathability. It generally does not get baggy after wet weather and it is less likely to be affected by the bright sunlight. It is suitable for summer camping trips as well. Nylon is best known for its inability to absorb water, and is known for being a lot lighter and cheaper in price. You will need to tighten the guy lines to maintain its shape, however. The main disadvantage of this material is that it may be affected by strong sunlight. 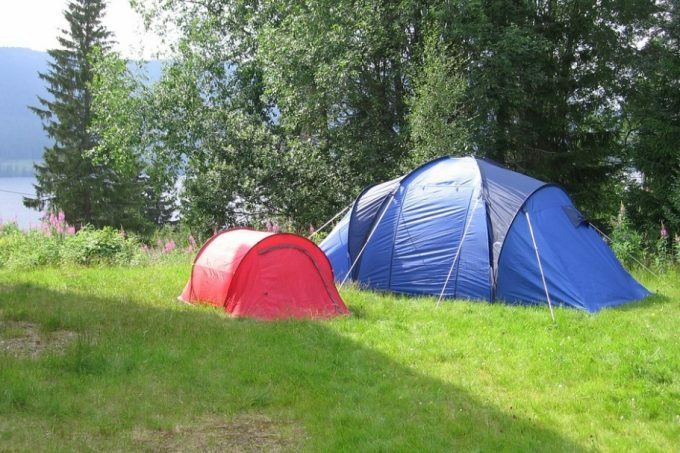 Do keep in mind that not all campsites are suitable for tents with large surface area and you will need to look for a larger spot for the tent. Not sure how to pitch the tent? Go online and browse tutorial videos on how to pitch the tent so that you would know how to pitch the tent when the time comes. Here’s a tip: look for the videos with good reviews so that you know you are watching an accurate video with sufficient information to help you with your tent. It is easy to find in most stores and is the most popular choice of all tents. It is designed to suit all dry, rainy and snowy seasons. However, they are not suitable for harsh or extreme weather conditions. A three-season tent is very useful in providing campers with adequate protection from rainy weather, as well as bugs. 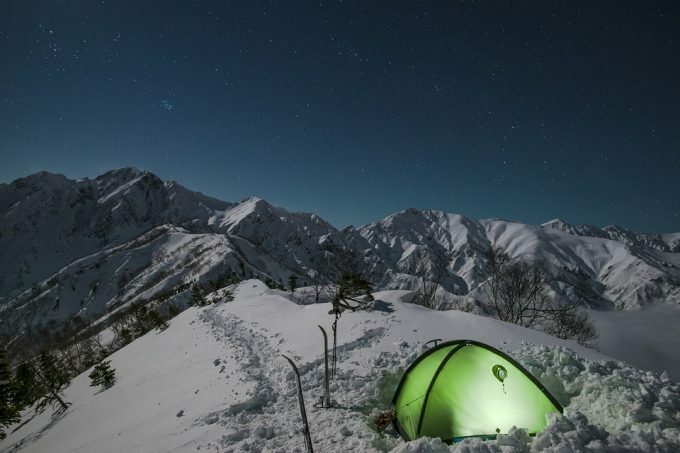 Four-season tents are weather-resistant. This type of tent is made up of heavier materials in comparison with the three-season tents, and they usually come with a few mesh panels and rainflies. They’re perfect and suitable for climbers and mountaineers. When you’re looking for a mix of everything, this type of tent would be the ideal tent for you. Here, we have a list of some of the best product reviews that we think may be useful for our fellow campers out there. Those that are considering on purchasing tents for their camping trips may find the details and product reviews useful. Specific features: 1000D polyethylene floor, 8.5mm fiberglass poles, 72” center height, electrical access port, a ground vent, interior mesh storage pocket, one door, large rear hooded window, shock-corded fiberglass frame, easy and convenient clip and a ‘pin and ring’ system. 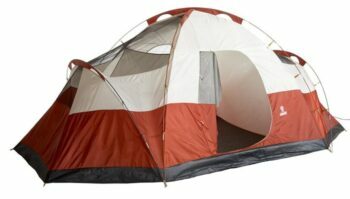 Description: The Coleman Sundome Tent is suitable for a camping group of 6 members. Its large door provides easy entrance and the hooded fly provides ventilation even during rainy weather. The polyester fly is solid and durable so the tent would not be baggy even under rainy or humid conditions. Its features do enable excellent ventilation and provides electrical access port for users to run AC power in the tent. This is an exceptional feature that would not be easily found in most other tents. Electricity during camping is a luxury that any camper would want to have. The tent is versatile and you can set it up on a convenient flat surface, definitely not on life threatening terrain. The flooring fairs well, but you need to handle it with care since it is made of polyethylene. You should consider placing waterproof canvas on top of the flooring to improve its durability. It is made of durable polyester material that is strong, flexible, and highly resistant to shrinking and wrinkles. The tent has a large floor area and volume that can accommodate six people, making it an idea tent for family camping. It is a lightweight tent that is convenient for backpacking. The flooring is made of cheap 1000D polyethylene material that wears out after some time. Fiberglass poles aren’t as strong as aluminum poles. Related: The accessories that are bought frequently together with this tent are Coleman Tent Kit and Etekcity 2 Pack LED Lantern. The tent kit provides you with installation and cleaning tools. The LED lantern is useful for indoor and outdoor tent lighting. Special features: Pre-attached poles for easy setup, Weather Tec system, 2 doors, 7 windows, removable room dividers, base measurement of 14 by 10 feet, and center height of 6’ 5”. Description: The Coleman’s Instant Tent features vertical walls with taller center heights, making it perfect for a large group of campers. It is spacious for the accommodation of up to 8 persons, designed with 2 rooms for quick and easy assembly. It features a Weather Tec system that protects users from extreme weather conditions. The design is rugged and very resourceful, fitted with well-defined doors and windows for optimum ventilation. Apart from ample ventilation, the doors and windows offer a magnificent view of the surrounding while keeping the occupants sheltered and safe from biting insects. The tent is made up of a high performing rainfly, which will keep you dry and safe from light rains as well as heavy rains. You should expect some moisture when camping in a bad storm, though. It is a big tent so you may want to do some installation practice at home before depart into the wild. It is one of the largest family camping tents with enough space for accommodating two queen luxury airbeds. The tent’s fabric is made of heavy duty 150D material that is tear-resistant and easy to maintain. In addition to an effective rainfly, the tent is made of WeatherTec system that consists of welded floor and waterproof walls. A highly breathable tent with seven windows and two doors for effective ventilation and a clear view of the environment. Related: The tent is usually bought together with the Coleman Instant Tent Rainfly and the Dry Top Reversible Tarp. You need the rainfly for reinforcing the tent’s rainproof ability, and the tarp for protecting the tents floor from hard ground and rock terrain. Specific features: Base measurement of 17 by 10 feet, removable room dividers, Weather Tec System, separate storage bags, Cool Air-port, Variflo venting system. Description: Coleman’s Red Canyon Tent is great for outdoor camping trips, with the ability to accommodate up to 8 campers for a good night’s sleep. It is spacious and is able to accommodate a whole family of 8 members to have a great campers’ night, ideal for just any family camping trip. The tent’s Cool-Air-port and Variflo adjustable venting system allows one to adjust airflow and access gear. The tent’s exclusive WeatherTec System that is sure to keep users dry from wet weather during camping trips. This is a very important feature that allows you to continue camping in raining conditions. What make this tent so phenomenal is the design, material, floor area and volume. The fabric is made of heavy-duty fabric that is breathable and very comfortable. The tent’s ventilation and waterproofing abilities are remarkable. As far as space is concerned, the tent is large enough for family and friends. The tent has a robust, spacious and heavy-duty design made of quality material for extended durability. It is one of the easiest tents to setup; even though you will have to get familiar with the setup. The tent has a number of storage compartments, including the ceiling gear net and interior pockets. The design is incorporated with high performing water-resistance, temperature control and ventilation systems. Limited doors when compared to competitor models. It can’t withstand bad storms. Related: If you want your tent to be more water repellent and UV safe, we suggest checking out the Nikwax Tent and Gear Solar Proof. Specific features: Base measurement of 14 by 14 feet, center height of 7’ 1”, 6’ 3” eave height, pin and ring system for setting up connecting hubs, mesh dutch D-style door, 2 bay windows, 2 picture windows, rear lockers, two gear lofts and two hanging pockets, welded polyethylene floor. Description: The Wenzel Kodiak Tent is a budget-friendly and family-friendly gear that provides spacious comfort for up to 9 campers. 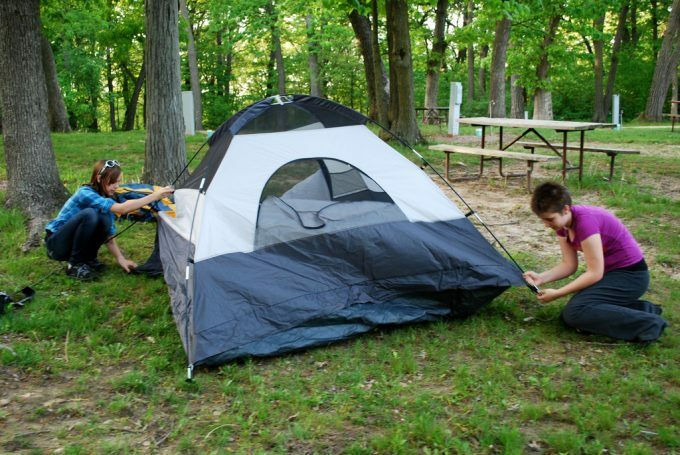 The tent is fully equipped for family camping in the middle of the woods that is easy to set up and store. The roof of the tent provides great visibility and a nice cross breeze. The tent’s rear lockers, two gear lofts and two hanging pockets makes it easy for things to be organized. The ground level of the tent allows ventilation for increased air flow. During rainy weather, campers don’t have to worry as Kodiak’s welded polyethylene floor provides the protection for campers to stay dry. The steel frame, stakes and full coverage rainfly ensures that the tent stays upright, stable and waterproof in the rain. The tent’s design is unique and made of heavy duty materials. It actually resembles an actual house, such as a tiny house. This is pretty cool because it gives you the illusion of a real house while camping out-of-doors. Has a unique design that resembles a tiny house, giving you an impression of a real house. The tent’s structure is integrated with robust steel frame along with ring & pin system and hub connections for easy installation. A very spacious and ergonomic interior that consists of two rooms, storage duffel, mud mat, hanging pockets, and gear lofts. Full coverage rainfly reinforces the tent’s defense against heavy rains, ensuring that you stay dry. The front zippers aren’t waterproof, leakage may occur through them in heavy rains. Related: This product is frequently bought together with Coleman Tent Kit and Etekcity LED Lantern. The kit is necessary for the tent’s setup and cleaning, and the LED lantern is for effective illumination of the tent at night. Specific features: One center door, two side doors, taped fly seams, zippered carrying bag, removable divider, six windows. Description: The Ozark Trail Tent is a great tent for a large group of campers with up to 10 persons as it is spacious enough to accommodate 10 persons, along with its equipped weather armor feature. It has separate entrances for added privacy and easy entry into the tent. The tent’s six windows and two side doors allow increased ventilation and panoramic views. Its taped fly seams prevent leakage. Campers don’t have to worry about rainy weather as it is weather resistant. The taped fly seams prevent leakage in rainy or foggy weather conditions. This is a great tent for a family that is going camping for the first time. The tent’s trapezoid sides and square center offer you and your family the desired amount of space. It is remarkably spacious to the extent that it can accommodate a queen inflatable bed, and not to mention how easy it is to set up and collapse. This tent is an appropriate Christmas gift that you can buy your family or friends. Anyone would appreciate all that space. The two side doors and six windows provide the much needed ventilation. You can also enjoy panoramic views of the environment. The tent is so huge, thus allowing you to set up three queen air mattresses for luxury sleep time. It is reinforced with taped fly seams for improved water-proofing. Related: This tent is regularly bought together with Coleman Tent Kit and Etekcity LED Lantern. The kit is useful during set up and cleaning. On the other hand, the lanterns will illuminate the tent. 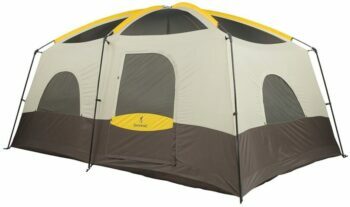 Specific features: 2-room dome, double D-door with storm mesh cover, 3 mesh-zippered windows, mesh ceiling. 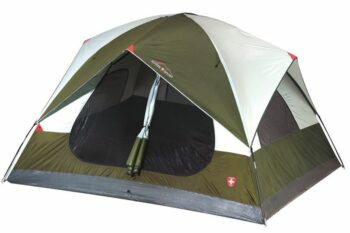 Description: The Suisse Sport Mammoth Tent is suitable for family camping trips. It allows the accommodation of up to 6 persons. 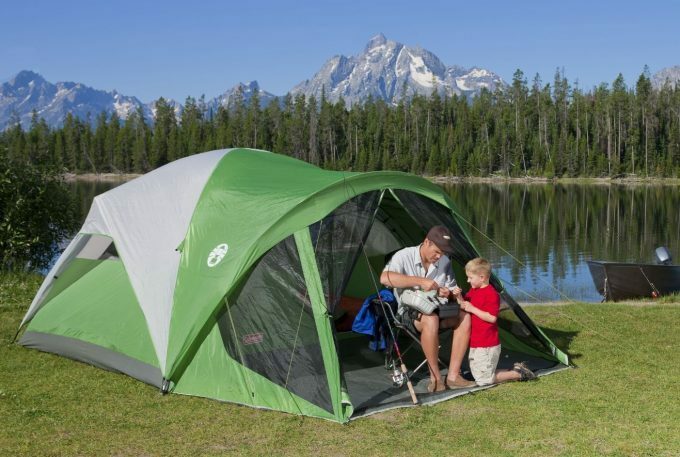 You can take your entire family on a happy camping trip with this Suisse Sport Mammoth with fairly easy setups and instruction manual that is concise and allows one to easily setup the tent within just minutes. The tent has three windows to allow increased airflow and ventilation. The tent can be separated into 2 rooms for added privacy or storage of outdoor gear. You can transform the tent into a single room for a family gathering or entertainment by removing the divider that splits the tent into two rooms. If you are new to camping, then this is the right tent to buy. The design is sturdy, ergonomic and user-friendly because it does not need a lot of strings to hold it in place. The height is good; a 5’3” individual can easily stand at the middle. The design is sturdy made of high quality materials for comfort and durability. It is fitted with double-d doors for easy and fast entry as well as exit. The tent is installed with a storm mesh cover that is effective for preventing light rains. The removable divider allows you to easily split the tent into two rooms for privacy. The storm mesh cover is not strong to hold off bad storms. Related: There are no products that are frequently bought together with this tent. However, for easy setup, maintenance and efficiency, you can choose to buy the following items: Dry Top Blue Poly Tarp, Intex Classic Downy Airbed, Ultra Bright LED Lantern, and Coleman Tent Kit. Specific features: Capable of being divided into two rooms, each having a zippered divider panel with 3 pockets, steel stakes, 150D polyester oxford floor with 2000mm coating, a 75D 185T polyester fly, guy ropes. Description: The Browning Camping Big Horn is spacious for the entire family or hunting group, perfect for camping trips that require an overnight stay. Its factory sealed fly and floor seams provides campers great protection from weather, with extra-large zippers on doors and straight side walls to allow more room for cots. This tent has one of the best free standing structures that features steel uprights and fiberglass poles for additional support. The interior design is spacious enough for a couple of people. In fact, the interior is fitted with straight sidewalls and stands tall for maximum usability. The tent’s water resistance system is remarkable; however, it can only last a few days before the tent gets saturated. When compared to most competitor models, the waterproofing capability of this tent is amazing. The tent is also installed with interior pouches for stowing small gear and accessories, and you can use the center divider zip to hang lightweight items. It has one of the best free standing structures consisting of steel uprights and fiberglass poles for additional strength. It is incorporated with resourceful weather protection that can last a few days before saturating the tent during heavy rains. Easy setup, meaning that you do not need special skills but basic understanding. It has extra tall center height for easy standing and a divider for room separation. A two-person tent is small for a family of more than two. Related: The tent is regularly bought together with Poly Tarp and Coleman Tent Kit. The Poly Tarp is essential for reinforcing the tent floor, and you can use the tent kit for installation and cleaning. 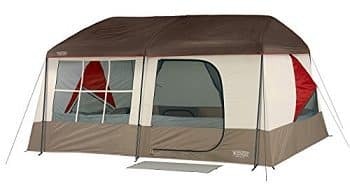 Specific features: Large mesh roof and windows, large Dutch D-style door, hoop fly frame, utility pocket and gear loft, attached mat, integrated stow-n-go duffel system, shock-corded fiberglass poles, snag-free pole pockets. Description: The Mountain Trails Twin Peaks Tent is perfect for a smaller group of campers, with the ability to accommodate up to 3 persons. Its utility pocket and gear loft allow campers to keep personal items within easy-to-reach distance. Its attached mat helps keep the tent floor clean and clear. Its integrated stow-n-go duffel system makes it easy to setup to be done and easy storage. As it is weather resistant, it is suitable for camping trips for both summer and wet weather conditions. It is one of the lightest backpacking and family camping tent weighing less than 6 pounds. This quality design is made up of polyester fabric and shock-corded frame made of fiberglass. These materials are sturdy and durable. 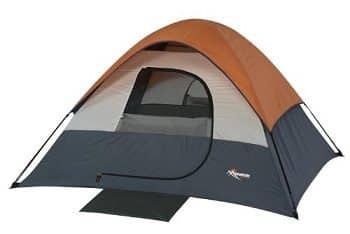 This is a convenient tent because of backpacking, especially for one to three people. The tent’s ability to accommodate three people depends entirely on the family, because it may be a stretch for people with heavy bodies. It has a sturdy design made of polyester fabric and fiberglass frame for easy setup and durability. It is fitted with patented hooped fly frame for weather protection; the frame is good enough for holding off light rains. The tent is lightweight and convenient for light backpacking. The design is integrated with large windows and mesh roof vents for better ventilation. Related: This tent is normally bought together with the Intex Classic Downy Airbed and Etekcity LED Lantern. The downy airbed offers a comfy bed and it comes with hand pump and inflatable pillows. The LED lantern will keep your tent illuminated. Finally, after reading the details we have provided in this article, along with the reader-friendly product reviews, we hope you are able to decide on the type of camping tent to purchase to bring with you on your camping trip. Try to remember and do a little research to find out more information about the products before deciding to purchase it. 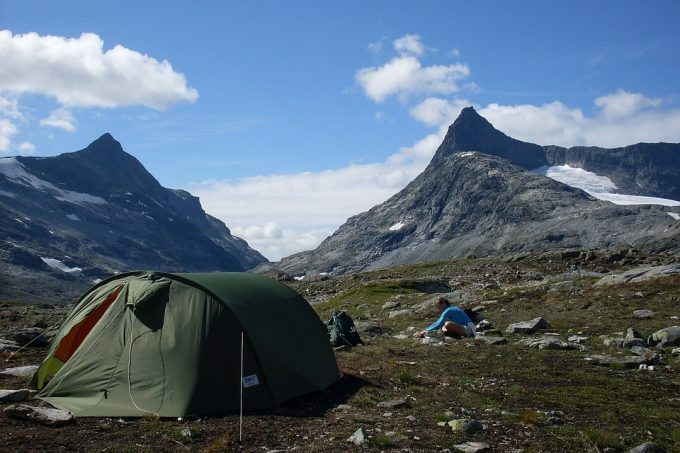 Has this information helped you in making the right decision of buying a reliable tent? How did it perform? Was it comfortable as advertised? Please share your thoughts and experiences with us in the comments below.